Garry and Paige Simpson created Simpson Mechanical in 1999 with a commitment to "raise the bar" in the new home construction industry. Through their dedication of caring about the comfort level of their customer, hiring the best employees, and maintaining strong and loyal vendor relationships, the company has quickly become one of the most trusted names in the industry. "We've always been a little different because we place an as equal focus on knowledge as we do technology" says Garry. "There are many great products, but they're only as good as the knowledge used to install the technology. Through our training process, we ensure that each of our technicians are equipped to maximize the technology for optimum system performance." 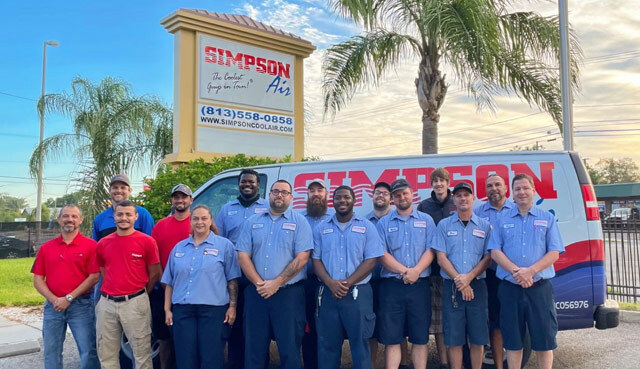 Now one of the top Carrier Factory Authorized Dealers on the West Coast of Florida, Simpson has grown from just 3 employees to their current 30 plus employees serving Simpson Mechanical (new home construction and commercial) and Simpson Air (residential service, repair and product replacement). In 1975, Garry Simpson began his HVAC career as an apprentice with Climate Control of Clearwater. Throughout this time he gained experience in all aspects of the HVAC trade. In 1994 he joined The Trane Company. "Trane provided me with a great deal of business information and training," Garry stated. "With their emphasis on dealer support, they taught me the importance of client-vendor relationships and how to operate a business successfully." Paige Simpson has a background in marketing and management which complemented Garry's field expertise so they decided to start their own business. "I had learned a lot about air conditioning, and I really knew new construction," Garry said. "It also happened to be a great time to enter the market." From repairing an AC system that is down to installing a high efficiency central air system, Simpson is dedicated to handling customer needs quickly and efficiently. By only choosing projects in a logical geographical area and not stretching their technicians too thin, they can be available to handle emergency calls the same day. "Our customers have been very impressed with our short response times, " Garry said. "Our commitment to customer service has resulted in many of the homeowners becoming loyal customers and telling their friends about their positive experience." Garry's many years in the business have given him an unparalleled understanding of how to optimize a system and ensure comfort for the homeowner. Simpson's expert duct design and layout guide our craftsmen as they fabricate the custom air distribution system. The project specific design then provides a detailed "map" for the field installation technicians to effectively and efficiently install the air distribution system. The project nears completion as the equipment installation specialist place the heating and cooling system as detailed by our department. Our certified service technicians commission the equipment to the manufacturers exacting specifications. At the completion of our detailed quality control inspection the technician places the final signature on your Simpson Signature System Honor Roll™. The quality installation that results from this superior design process provides Simpson Mechanical with literally, "The Coolest Customers in Town", (time after time after time)! We run our design department on the Simpson philosophy that whatever you do, do it right from the beginning; if you do it right the first time you have fewer call backs, paperwork and manpower resulting in more satisfied customers and greater efficiency. With an eye on the future, Garry and Paige see the HVAC market changing and they are changing as well. Their service maintenance and add on replacement business is expanding. "We continue to become more involved in the residential add-on replacement market." Garry stated. "It's a market that requires a lot of flexibility, as each installation is unique." And so the Simpson Team continues to succeed in the HVAC industry. Their continued commitment to unmatched customer service allows them to deliver the quality service they have become known for over the years.